When configuring OpsCenter for Kerberos authentication, create and configure the OpsCenter principals first, and then add the cluster to OpsCenter. Before configuring OpsCenter to use Kerberos authentication, configure DSE for Kerberos. The DSE documentation provides guidelines, samples, and a tutorial for configuring Kerberos with DSE. Prepare DSE nodes for Kerberos. The method of creating Kerberos principals differs depending on the type of Kerberos Key Distribution Center (KDC) server used. The following procedures are based on MIT Kerberos. Kerberos principals must be fully qualified with a realm, which in the following examples is EXAMPLE.COM. The realm follows the @ sign in the principal, and is typically all upper case. The first part of the principal represents a specific identity in the realm, such as a user or service. Kerberos user principals typically have a single component, plus the realm. For example, user@EXAMPLE.COM. Kerberos service principals represent programs of different types, and follow the format service/HOST@EXAMPLE.COM. The HOST is the name of the server, such as node1.example.com. Important: In the following procedure, the format of the service principal must match the format of the information in the keytab that was created with the kadmin command. For example, if the service principal is service/HOST@EXAMPLE.COM, then the principal in the keytab must use the same format. The Kerberos commands in this procedure use the following format. For more details on using the kadmin CLI, see the kadmin help. kadmin Launch Kerberos admin shell with an administrator account that has add privileges. addprinc Create a new service principal for the node. -randkey Set the key of the principal to a random value. service_name User-defined name of the service. For example, opscenterd. FQDN The fully qualified domain name of the node. For example, node1.example.com. Use the kinit command to obtain and cache an initial ticket-granting ticket for the admin user. Enter the password for the admin user when prompted. where dse is the cluster to log in to. Run the kadmin command to access the kadmin CLI. Enter the password for the admin user when prompted to access the kadmin: prompt. Create a service principal for the OpsCenter daemon (opscenterd), plus an additional principal for HTTP communication. The service principal format for OpsCenter is opscenterd/FQDN, where FQDN is the Fully Qualified Domain Name of the OpsCenter node. The following example uses opscenterd as the principal name, but can be any valid name. Note: If configuring high availability for OpsCenter, a principal must be created for the OpsCenter primary and backup instances. Create a shared principal for the OpsCenter DataStax agents, or create one principal per agent. The service principal format for the DataStax agent node is dxagent/FQDN, where FQDN is the Fully Qualified Domain Name of the DataStax agent node. The following example uses dx-agent as the principal name, but can be any valid name. Important: If creating one principal for each DataStax agent, manually update the kerberos_client_principal property for each agent in address.yaml. Verify that the principals have been added by running the listprincs command with kadmin. where node*.example.com is the FQDN and EXAMPLE.COM is the Kerberos realm, which must be all uppercase. Create a Cassandra user for the OpsCenter daemon principal. The CQL role must be the same as the principal name created in 3. In this example, the principal name and the CQL role name is opscenterd. Create corresponding Cassandra users for all DataStax agent principals created in 4. The CQL role name must be the same as the principal name. In this example, dx-agent is both the principal name and the CQL role name. To view the roles that were created on the node, run the LIST ROLES command in cqlsh. Use the kadmin CLI to create two keytab files that map to the previously created principals: one for the OpsCenter node, and one for DataStax agents. If using one principal for each DataStax agent, create one keytab for each. The keytab file is used to store the Kerberos principals created in the previous steps. To obtain principal information (outside of kadmin), use the klist command. In the following example, the command requests the ticket from the krb5_opsc.keytab file. 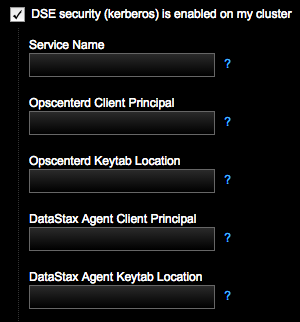 On the OpsCenter node and on each node running a DataStax agent, create a directory to store the keytab files. The recommended directory on each node is /etc/opscenter/security. Copy the generated keytab files to location created in 9. For example, /etc/opscenter/security/krb5_opsc.keytab. The keytab locations are set in the following properties in the cluster_name.conf file after adding the cluster to OpsCenter in 12. Change the owner of the keytabs and the keytabs directory for OpsCenter and the DataStax agent. Replace the directory paths with the keytab locations created in the previous step. Add the cluster to OpsCenter. The user adding the cluster to OpsCenter must have privileges on the DSE node to add the cluster. Note: When adding the cluster, select DSE security (kerberos) is enabled on my cluster and input the required information. Enter the Service Name. This name must match the user name of the Kerberos service used by DSE, which is defined in dse.yaml. For example, if the server principal is dse/HOST@EXAMPLE.COM, the Service Name should be dse. Enter the Opscenterd Client Principal created in 3. Enter the Opscenterd Keytab Location location created in 8. This keytab contains credentials for the opscenter_client_principal. Enter the DataStax Agent Client Principal created in 4. Important: If using a different principal for each DataStax agent, the value entered in this field is a placeholder only. Because each DataStax agent has a different principal name, set the kerberos_client_principal property in address.yaml for each DataStax agent. Enter the DataStax Agent Keytab Location location created in 8. This keytab contains credentials for the agent_client_principal. After specifying the Kerberos information, click Next and complete the remaining prompts to add the node to OpsCenter. If different principals were created for each DataStax agent in 4, restart each agent. After the cluster is added to OpsCenter, the values entered for each field are saved in a configuration file specific to the cluster. The file is created as /etc/opscenter/clusters/cluster_name.conf.